I suspect some staffers at the Empire State Development Corporation (ESDC) think I'm a bit of a pest, though they're professional and don't say so explicitly. After all, I file regular Freedom of Information Law (FOIL) requests, sometimes a couple each month. And it usually takes a long time to get responses from the ESDC, especially compared to more responsive agencies such as the Metropolitan Transportation Authority (MTA). Last December, I filed a FOIL request for records explaining whether the ESDC considered the availability of tax-exempt financing for affordable housing when it was approving Atlantic Yards. For months, I got a certified letter each month explaining that they were still looking, given that my request was broad. That's hard to judge, but it sure seemed like a long time. In a brief public comment during the last desultory moments of the July 30 public hearing on Atlantic Yards, I mentioned the lingering request and asked for it to be resolved. I finally got a response in August. Coincidence or result? I can't be sure. After the ESDC board meeting September 17, ESDC Senior Counsel Steve Matlin said that the KPMG market study mentioned at the meeting might have some proprietary information, but said staff would look at the issue--and presumably decide about releasing the document--"in the next few days." I and others finally got it on October 7, a day after I'd published a video of Matlin's statement. Coincidence or result? I can't be sure. 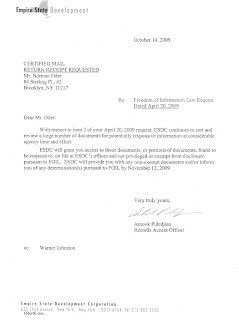 Eliot Brown of the New York Observer had filed a FOIL request, and wrote that he received the report in response to that request. I file my requests via email but I get the responses via snail mail, certified, at $5.54 a clip for the thinnest of envelopes. First, I get an acknowledgment that they've received my request. Someday, perhaps, I get the response to my request. In between, however, I typically get a monthly letter indicating that they're still searching for responsive records. So, I get a lot of mail, and I'm almost never home to receive it. If I didn't live alone, or designated someone to accept my mail, this wouldn't be a problem. Instead, I must go to my local post office, wait on line, then wait for the postal worker to find the particular letter at issue. It's a 20-minute round-trip for me to walk to the post office, but that's only the first step. The wait on line can be ten to 30 minutes, while the wait at the counter for the postal worker to retrieve the piece of mail can take three to 20 minutes. Twice I've waited 20 minutes only to learn that the letter cannot be found. All this for a piece of mail, which, more often than not, is a merely administrative formality rather than one containing information requested. I know ESDC can't be blamed for this, but I see it as karmically balancing the perceived frustration on both ends of the transacton. Other agencies manage with greater efficiency and lower cost. The New York City Economic Development Corporation responds by email. The Metropolitan Transportation Authority and the New York City Department of City Planning send both email and snail mail (at $.44/letter, right), but don't certify the latter. If other agencies can manage, couldn't the ESDC do so as well? Spokesman Warner Johnston responded, "We maintain the highest standards when it comes to following the provision of FOILs and utilize certified mail as it is the most reliable method to ensure that FOILs are received by the time set by law." Sure, certified mail is the most reliable method to ensure that a delivery attempt is made by the time set by law. Actual receipt, as I've discovered, is another matter. Johnston added, "We spend exponentially more tax dollars and staff hours in researching and gathering information for broadly worded FOIL requests than we do in postage expense." ESDC continues to sort and review a large number of documents for potentially responsive information at considerable agency time and effort. I don't doubt that in-house effort costs more than postage, though I suspect that the ESDC also has spent exponentially more paying environmental consultant AKRF--the tab neared $5 million in May 2007--and outside counsel for the lawsuits the project has engendered. Also, some of that cost responding to FOIL requests might have been obviated had the ESDC been more transparent from the start. And the ESDC has not exactly been penny-pinching; after all, as the New York Post reported in September, former agency head Avi Schick was paid his $213,000 annual salary for eight months after his resignation. That $142,000 could pay for a lot of transparency. I'd note that the process of sending a certified letter takes more time than email. It's not a huge issue, but, if and when some agency or consultant takes a broad look at FOIL practices, it's worth consideration: why have other agencies decided they need not maintain such high (and somewhat more costly) standards? While some city agencies have been somewhat more responsive than the ESDC, that doesn't prove true across the board. Last year I tried to figure out how the city decided to add $105 million to Atlantic Yards subsidies. At first, I was stonewalled. Then I didn't get a real answer. Over the past eight years, Bloomberg's City Hall has put an unprecedented amount of public information online. Most agencies have become more accessible to the press, even if getting city officials on the phone can be difficult. But some parts of the Bloomberg administration—some of the rooms in the house—are as or more impenetrable as they were under Giuliani. And according to watchdogs, researchers and reporters, gaining access to some agencies' documents through the Freedom of Information Law has been unjustifiably difficult.